We see all comers, from the worried well to the critically ill; from birth to death; and with conditions involving all parts of the mind, body, and spirit; from brain trauma to ingrown toenails. Our patients come to us trusting that we will respect their concerns and that we will provide care for them. As emergency nurses, we have a responsibility to respect that trust and provide our patients with the skill and expert knowledge required for their care. Emergency nurses see it all. Disasters have claimed millions of lives and cost billions of dollars worldwide in the past few decades. Goodwin Veenema suggests that there is, on average, a disaster requiring international assistance every week (2013). Tragedies such as the September 11th World Trade Center attacks, Hurricane Katrina, and the 2010 earthquake in Haiti have led heath care providers to critically review their processes in order to deal with such events. “Photograph by Jocelyn Augustino taken on 08/30/2005 in Louisiana” by Jocelyn Augustino, FEMA / FEMA Photo Library is released in the Public Domain, via Wikimedia Commons. 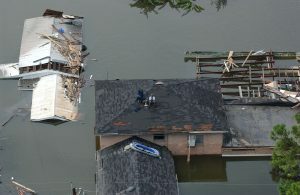 About this photo: New Orleans, LA, Aerial views of damage caused from Hurricane Katrina the day after the hurricane hit. Nurses need to be familiar with their role in emergency preparedness and disaster planning as they frequently have wide-ranging leadership responsibilities for community- and hospital-level disaster preparedness and response. This chapter discusses the definition of a disaster, either natural or anthropogenic (caused by humans), disaster preparedness and planning, and the disaster response.